Too often, marketers will design their marketing campaigns — whether online or by direct mail — and cross their fingers that in time, response rates will go up. There's no need to cross your fingers anymore. Marketers can count on response rates going up when they take advantage of the personalization tactics that have been shown time and time again to boost engagement. Take a look at these eight effective ways to boost your response rates through the use of personalized marketing strategies. It seems so simple: Use your customers' first names to get them to respond. But it works. With the right customer data, this can be done in email subject lines or openers, direct mail pieces, and more. Yes, it's simple. But are you doing it? Including a first name isn't the only choice available when trying to grab a customer’s attention. Dig into browsing data to intrigue them. For instance, if a customer has been browsing boots on a clothing site (but ignoring shirts, jewelry, and sneakers), try a subject line that invites them to "Check out these brand-new boots for cozy toes this winter." According to a recent study, personalized subject lines enjoy 58% higher click-to-open rates than those without personalization. Consumers are getting used to receiving personally addressed marketing emails. But how often do they get an email from, say, the head of the company? When you personalize who the email is from, it creates an opportunity to build a true connection between the customer and brand. When taking this approach, also consider adding a personalized touch within the email so it is more likely to be perceived as genuine. While most marketing campaigns focus on digital media these days, there's a lot to be said for the effect of a physical, tangible item that connects personally to a customer, especially if you're promoting an upscale brand or product. In fact, data from the Data & Marketing Association (DMA) shows personalized direct mail campaigns can increase ROI between 3X to 10X. New technologies, such as variable data printing, allow brands to print personalized direct mail pieces at scale. Magazines, for example, can deliver a far greater ROI on advertising spends than either digital video or mobile ads — as the details of this innovative campaign show. Data from the Data & Marketing Association (DMA) shows personalized direct mail campaigns can increase ROI between 3X to 10X. Your response rates will rise and fall based on the personalized, targeted nature of the content your customers read when they open your email or direct mail piece. If your customer sees nothing they can relate to, or if they feel as if they were sent a piece of copied-and-pasted spam, they'll ignore it. A simple way to personalize content is with geo-targeted messaging. If the content makes a customer feel as if they are understood and your brand can therefore meet their needs, you will greatly increase the chance of them becoming and staying a customer. With dynamic content, brands can send a mass email, potentially to thousands of customers, with one or more pieces of the email tailored to a customer’s interests. This can be done with various data points based on behavior or demographics. For example, meal delivery service Postmates sends out regular emails to its users telling them what people in their area are ordering for lunch — which highlights their local choices while reminding them of the service available with only a click. 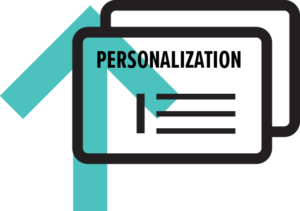 When customers convert on a website, whether it’s via a purchase or online form, and come back for repeat visits, you collect plenty of transactional and browsing data that can be used in personalized marketing campaigns. A few of these tactics include utilizing recommendation engines to suggest products related to previous conversions ("You might also like..."), send emails when prices drop on products they've purchased before, or send coupons in the mail for frequent purchases. Do you have a rewards program in place? You don't have to be a mega-corporation with thousands of outlets to take advantage of this useful technique to build customer loyalty. When you track reward point accumulation digitally, you can send personalized reminders ("Only one more coffee, and you've earned a free pastry!") or offer a free birthday gift to remind customers that you're thinking of them. The more personalization techniques you put to use in your direct mail and email campaigns, the greater the boost you're likely to see in customer response. Try making small changes at first, with an eye on your metrics to see what's working best, and don't be surprised to see your numbers improving.